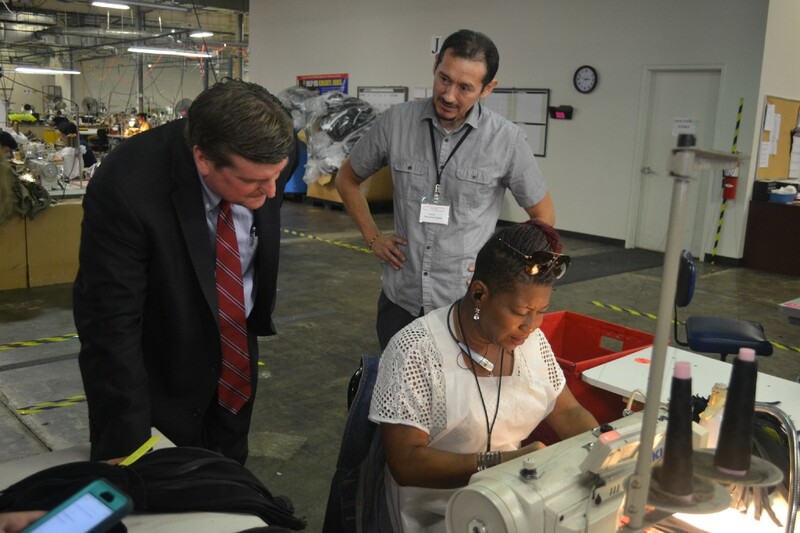 A nonprofit corporation, Bestwork Industries employs blind and visually impaired people to manufacture a variety of different clothing and utility products. Bestwork moved to Cherry Hill in part thanks to money from the New Jersey Economic Development Authority’s Small Business Fund. New Jersey Economic Development Authority President and Chief Operating Officer Tim Lizura (left) and Bestwork Industries for the Blind technician Carlos Benjumea Zapata (right) watch as Bestwork employee Roxann Brooks works on putting zippers together during her shift last Wednesday. Cherry Hill resident John Wescott spent last Wednesday afternoon stitching small buttonholes on pocket flaps to be used on pairs of pants for the United States Air Force. Westcott works efficiently, placing the flap under a sewing machine and holding it in place as a machine stitches the holes onto the flaps. Once the machine completes its job, he uses his hands to inspect the job. “It’s stitched properly, so I know that it’s done right,” Wescott said. Westcott and many of his co-workers are blind or visually impaired. They work at Cherry Hill-based Bestwork Industries for the Blind, a not-for-profit manufacturing corporation. Since its founding in 1981, Bestwork has manufactured items such as military clothing, traffic safety and construction clothing, vinyl tool bags, laundry nets and polishing and wiping cloths. What separates the organization from other manufacturers is its mission. Bestwork employs blind and visually impaired adults to manufacture its products, giving employees an opportunity to earn a living while providing quality items for customers. In 2013, Bestwork received a boost when it moved to Cherry Hill with help from the New Jersey Economic Development Authority’s Small Business Fund. The EDA provided $1 million to go toward a $3 million loan from TD Bank. The loan allowed Bestwork to move from its smaller former facility in Runnemede to its new location along Olney Avenue in Cherry Hill. With it comes an ability to expand in a number of ways. In 1981, James Varsaci, a veteran who lost his sight in World War II, founded Bestwork Industries after a funding for a state workshop program employing blind and visually impaired people was halted. Varsaci began the corporation to give blind and visually impaired people an opportunity to work and produce high quality products for clients such as the U.S. military. Bestwork Industries was originally based out of Westmont and eventually moved to Runnemede in 1999. Over the years, the corporation has landed a number of government contracts to manufacture items for the military and general services. However, the nonprofit was limited in the amount of work it could do. To help with its expansion efforts, Bestwork Industries applied to receive funding from the New Jersey EDA Small Business Fund, which helps small businesses in New Jersey that have been in operation for at least a year and are unable to get bank financing, and nonprofit corporations operating for at least three years. EDA President and Chief Operating Officer Tim Lizura visited Bestwork’s new facility last Wednesday. The new location is nearly twice as big as its old facility, and it has opened the door to plenty of new opportunities. The expanded facility allows the corporation to bring in some commercial work in addition to its government contracts. With the amount of work increasing, Bestwork is also working on hiring more employees. Moore feels the ability to add jobs is possibly the most exciting part of the Bestwork’s expansion. The recruitment effort will give prospective employees opportunities to work alongside Wescott and others who have found a rewarding job at Bestwork. Wescott was Bestwork’s Employee of the Year in 2015 and has become a natural at using the sewing machine. Wescott and his co-workers’ jobs are made easier thanks to the automated and semi-automated machines with which they work. “You’re setting the machine, you’re hitting the button and it’s doing the operation,” Bestwork Operations Manager Jackie Herman said in describing the sewing process. The work process allows the employees to effectively manufacture products based on feel and touch. Bestwork employee Denise Baylor has worked for the corporation for 14 years. Baylor lost her eyesight more than 30 years ago and admits she never imagined she’d be able to work a manufacturing job. “I didn’t think I could do this without seeing,” she said.